The town of San Lorenzo de El Escorial is situated in the Guadarrama Sierra, around 60 kilometres from Madrid. 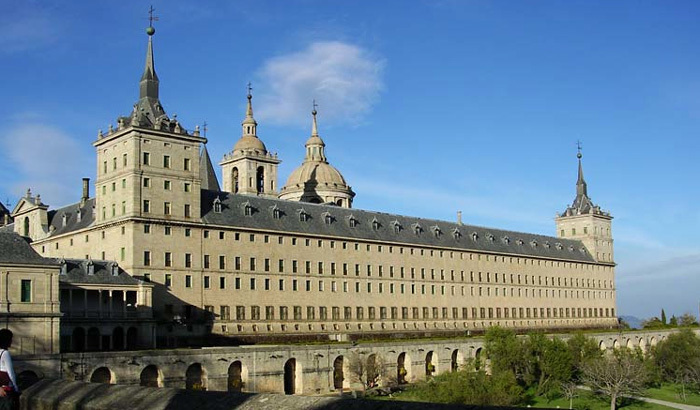 The main attraction of the town is the monastery of El Escorial, built by the Spanish King Phillip II to commemorate the victory against the French in 1557 and was considered the ‘eighth wonder of the world’. The monastery was the work of Juan Bautista de Toledo and Juan de Herrera. Like many other parts of central Spain, like Segovia and Avila, El Escorial is a UNESCO world heritage site. It was recognised as the political centre of Phillip II’s empire and was completed in 1584, the actual interior decoration wasn’t competed until the start of the 17th Century. The size of the place was meant to characterise the size of the empire: huge and the idea was to belittle visitors – it certainly succeeds! The whole complex comprises a monastery, a library, a royal mausoleum, a church and a museum. In fact, all the Spanish monarchs since Charles I have been laid to rest here, except Phillip V and Ferdinand VI. Even though the present king’s father, Don Juan de Borbón, was prevented from taking the throne by the fascist dictator Franco, King Juan Carlos made sure that his father’s remains took their place with those of the previous Spanish monarchs in the mausoleum. The remains of the princes and princesses can be found in the ‘Infantes’ mausoleum. The Italian painters Zuccaro, Tibaldi and Cambiaso painted some of the most important parts of the monastery, including the Sachristy, the library and the cloisters. In addition works of art by El Greco, Ribera, Titian, Velázquez, Bosch and Tintoretto can be found in Art Museum and chapter houses. Initially, the safekeeping of the site was put into the hands of the order of St Jerome but in 1885 Alfonso XII handed it over to the Augustine monks. Around 12 kilometres from El Escorial you will find the ‘Valle de los Caidos’ (valley of the fallen) a monument which was built by Franco to commemorate the dead of both sides of the civil war. Ironically, it was the Republican prisoners (16,000 of them) who quarried and lost their lives on this place. The basilica was dug 250 metres into the mountain and took around 20 years to build. It is the final resting place of Franco and José Antonio Primo de Rivera, the founder of the Spanish Falange and is without doubt one of the most unsettling ‘churches you will ever visit. The entrance of the cathedral is ‘guarded’ by 2 huge angels who wield enormous swords. Franco’s and José Antonio’s tomb are placed either side of the altar, above which you will find a fresco which apart from depicting Christ also includes some of Franco’s fascist troops. Directly above the altar on the mountain you will find what is called the largest free-standing cross in the world – around 150 metres high. However, whatever your feelings about the place you cannot fail to be impressed by its engineering and sheer dimensions. My wife and I will be returning to Spain 1 September 2006 on our way from Bilboa to Alicante. We wish to Visit the “Valle de Caidos”. Can you recommend an Hotel for us. We are pensionistas.